Technological advances in recent years have made it possible for regulatory bodies, non-governmental organisations, and citizens to employ more technologies in the monitoring and enforcement of environmental law. This video features three interviews – including one from Dr Andrea Berardi – about the innovative ways that drones, satellites and a smartphone app are helping to engage and empower organisations and citizens in the fight against environmental crime. 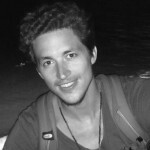 Géraud holds a PhD in international development from the Open University (2016). His expertise lies in the use of design and communication to draw bridges between research and policy, in order to facilitate collaboration and help generate creative solutions. He currently works for the London Borough of Barking and Dagenham as Policy Officer focussing on civil society, participation and social cohesion. He has presented his research at several international academic conferences and workshops, in Europe and in America.